In the last installment, Routing Policy -- interconnecting with other networks, we talked about the business relationships Joe's Internet (J-Inet) might have with other networks. Now we'll look a little closer at the technical side of how those relationships are enacted on the network itself. Before we get too much closer to J-Inet, I want to point out that I'm going to be using a single network model for continuity between posts. I've worked out IP addressing (v4 & v6), consistent routing policies, and a topology that should suffice for many posts. I've got several posts lined up that should help show at least one path to building a scalable network. J-Inet has two transit providers (Transit 1 & 2), three customers (Customer A, B, & C), and a single Peer (Peer 1). Customer C is a bit of stretch for this conversation. They aren't an autonomous system, but we'll look at them anyway, as it may lead some readers to revelations they might not have otherwise. J-Inet has four Points of Presence (POPs) where equipment is housed. Most customers of J-Inet are like Customer C. They simply buy transit from J-Inet. These customers actually make up the bulk of J-Inet's revenue. But they're pretty boring from an network perspective. Customer A uses 172.16.36.0/24. That block comes from J-Inet's prefixes, but they are allowed to use it as long as they are a customer of J-Inet. J-Inet also allows Customer A to advertise this prefix across any interconnects they may have with other networks. J-Inet will pass all of the prefixes it knows about to Customer A. Customer B uses 10.193.32.0/22, which was allocated to them from their Regional Internet Registry. They advertise this prefix to us, and any other interconnects they have according to their own routing policy. J-Inet will pass advertise all routes to Customer B. Customer C uses 192.168.93.112/28. They don't have any other interconnects, so they aren't really an autonomous system (AS). They're in this mix as a kind of anti-example -- a customer that really only acts as an extension of J-Inet's network and routing policy. Neither Customer C nor J-Inet will advertise prefixes to one another. Peer 1 is another ISP that happens to have equipment in the same building that houses POP 1. J-Inet and the Peer 1 decided that they should interconnect directly. They will be announcing 172.16.34.0/24 to J-Inet. J-Inet will pass internal and customer prefixes to Peer 1, but will not send any routes learned from transit providers. At this point, we have a pretty good idea of J-Inet's network topology and how it interconnects with customers, peers and transit providers. In our next installment, we'll look at some of the internal housekeeping of J-Inet's network is put together, and later use this internal configuration to make our interconnects simpler. 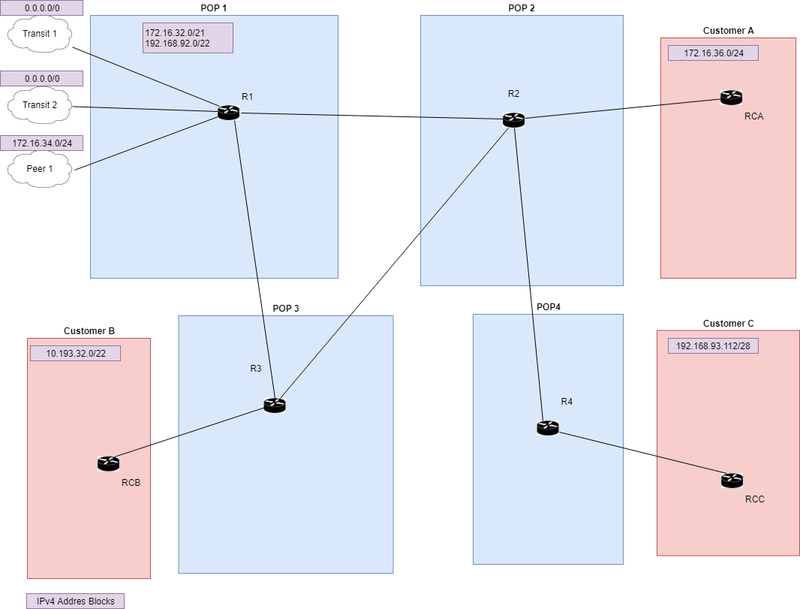 The next few posts about Joe's Internet (J-Inet) will start with our routing policy, and refine it based on some ideas concerning how to describe the interconnections between networks. We'll get a look at J-Inet's network soon, and eventually we'll see how the router configurations enact the routing policy. For now, let's get a grounding in how we can describe links between networks, and how they relate with routing policy. These thoughts are going to be the basis of our routing policy -- make money while keeping things simple and cheap. The types of networks we are discussing are referred to as Autonomous Systems (ASes). Within any AS are destinations referred to as prefixes or routes. When an AS interconnects with another, they advertise their prefixes to the other -- essentially offering a path to that destination. Transit -- If you buy Internet connectivity from someone, they are a transit provider. You can hand them traffic, and they will deliver it to the desired recipient, or will pass that traffic across their network to a provider that can get the traffic closer to its destination. For our purposes, if you pay people to take your traffic, you're buying transit. Customer -- If you supply transit to another network, they are a customer. The simplest customer relies on you completely, and more complex customers look at you in the same way you look at your transit provider(s). For our purposes, customers pay you to be their transit provider. Peering -- Sometimes, networks find that it is mutually advantageous to interconnect, and they decide to do so without either side paying for the privilege. Common customers, shared geographic regions, and other factors may influence if networks will become peers. We aren't going to worry about *why* some of our neighbors a peers -- we will just know that they are. Customer -- Goal: Maximize revenue. Always use this path if available. Peers -- Goal: Minimize cost: Use this path before using one to a transit provider. Transit -- Goal: Minimize cost. Use this path only if no better path exists. Transit -- Goal: Minimize costs. Only advertise internal prefixes and those that your are paid to carry (e.g. prefixes learned from Customers), thus minimizing traffic. Customer -- Goal: Maximize revenue. Advertise every prefix you know about to maximize traffic. Peering -- Goal: Minimize costs. Advertise the same set of prefixes as sent to Transit providers, in the hope of reducing transit costs. By describing AS interconnections as one of three different types, we've been able to express some routing goals that will support our business goals. In the next installment, we'll look at a map of J-Inet, start to see actual prefixes, and classify the inter-AS interconnects.